As our repeat visits to Anguilla accumulated, we began to be pleasantly greeted at the airport. When an immigration official would ask if it was our first visit, and we'd reply, no, it's actually our __-teenth, we'd be told, "Welcome home!" 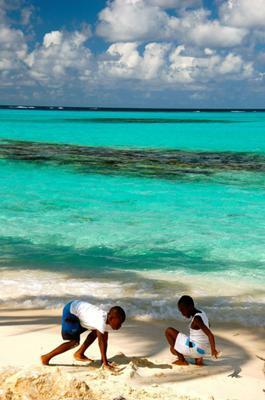 After returning to our favorite island year after year, Anguilla is very much a second home to us. Home, beyond shelter, is a comfortable, familiar, friendly feeling. It seems idyllic and proper to savor that familiar and comfortable vibe during our last (God forbid!) day on the island. We'd wake, of course, to the early morning crowing of the local rooster. And we'd be on Meads Bay, in our home base of Carimar. We're long-time guests of Carimar and each vacation starts, is punctuated by, and ends with truly sincere smiles from Heather, Avon and all the wonderful ladies in the property office. We start our day with a walk on Meads Bay, at the tide line, where the little plovers skitter in the purple sand, from Carimar down to Viceroy and then back to the rock cliff by Malliouhana, then return to Carimar, all ending with a swim in the gorgeous aqua water, with the serene blue sky and satellite islands in the distance. If we're lucky, we'll see a sizable crew of graceful brown pelicans diving for breakfast. As a special treat, we'll breakfast ourselves at Geraud's - for his superb coffee, delectable baked goods and perhaps a more Northern notion - a bowl of oatmeal. 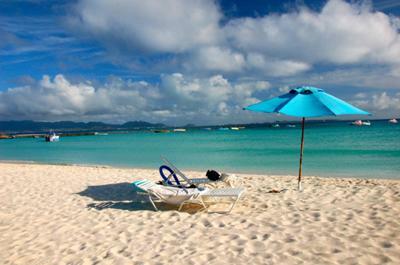 Anguilla is beaches - and we must say goodbye to some of our favorites. After eating, it's off to Cove, our west end friend. We love the unique combination of seclusion; life at Smokey's and the pier; and the ever-present view of St. Martin in the distance. Cove is warm, welcoming water, in its sheltered location, and we love to just float away time drifting over the water on our noodles. Lunch is typically a sandwich or salad at Carimar, but this is a special day, a day that requires a special treat - the simply unbelievably delicious Provencal flavored calamari risotto at Jacala. Superb - a Frenchman outdoing every Italian chef who's prepared any previous risotto dishes we have enjoyed. To be finished with Alain's pepper rum, of course! If one image of Anguilla stays forever in my memory, it would be the paradisical view of white sand, aqua water, blue sky, white cumulus clouds and green palm fronds gently waving in the sea breeze at the corner on Shoal Bay, before the hard right turn onto Upper Shoal. Photographed countless times by tourists, it is so stunning as to seem unreal. And, to be truly savored, the view must be appreciated from both the beach and from the water. So, it's dive into the sea again for an early afternoon swim. After drying, it's time for the quintessential Anguilloan drink - a rum punch. Every bartender has their own twist to this standby and every drinker his or her favorite. But certainly and consistently, the strongest, and quickest, route to happiness for us is a rum punch made by Gwen at her beach bar. Ah, so perfect. But close to the rum punch is another delectable concoction that I believe was first conceived at Malliouhana, and served with precision by Sam, now at the Cuisinart beach bar - the BB&C. Desert in a glass. Back to Carimar and Meads: change bathing suits and dive yet again into the sea. Then it's shower and on to another favorite beach, but a beach with a specific goal: Sunset on Long Bay. Perhaps it's imagination (but imagination repeatedly captured by Nikon), as the setting sun seems to play off the sea, waves and moist sand with a very special artistic, pastel beauty on Long Bay. And we always have that romantic moment to ourselves. Footprints follow us on the sand, but never another soul. 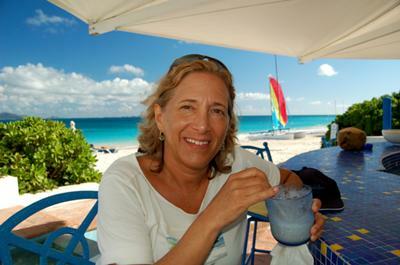 Anguilla is rightly noted for its phenomenal cuisine, and we have many, many favorite restaurants we enjoy. Sorry little friends we see peacefully grazing daily, but our final dinner starts with curried goat at Straw Hat, overlooking Meads, as served by Armel. 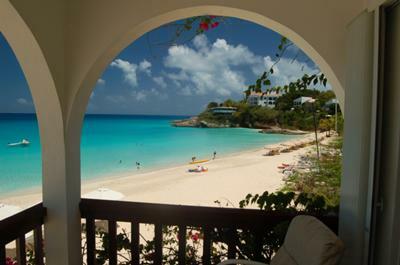 We often vacation on Anguilla as the UConn basketball team (men and women) plays for the national championship. And, so they are tonight, on Peter's bar (a Connecticut guy! ), victorious, of course. Then, sorry to rush off rudely, but we must drive a long ways east to call upon Shamash. Who else on Anguilla can prepare a truly sensational dish of seafood pasta - my favorite "Rasta Pasta" - brimming with a cornucopia of calamari, lobster, shrimp, whitefish and even crayfish, and prepare it joyously singing in an open kitchen while we salivate? Is it impolite to lick one's plate clean at a public restaurant?? Sadly - very sadly - this memorable day nears its conclusion - and calls for a night-cap. Let us take artistic license at this late hour, and finish our imbibing with a Mamma Wanna from Elvis, while Bankie Banx and Kinayah sing Bob Marley's "Three Little Birds" on the sand at Sandy Ground. A last day on Anguilla sorrowfully means departure, and our flight would surely not depart from Wallblake until just one minute before midnight, to conclude our full final day. A memorable, sad, joyous, idyllic final day spent at our home away from home, but surely a day that we shall delight in forever.